Opie’s Gift Gallery will be there with some reversible aprons and some snowman/pumpkin decorations. They will also have ties and much more. Dave the Honey Guy will be there with his fabulous honey products, with featured products this week being honey butter and lip balm in unflavored, cinnamon and cherry for the remainder of the season he will also have larger 3# and 5# jars for those who would like to stock up for winter. Gallons are available on a prepaid basis. Ma Fille Bakery will be there with apple pie, maple pear pie, oatmeal maple scones, donut holes, cinnamon rolls, and pound cake. Glen Haven Farm will have tomatoes,butternut squash, zucchini, garlic, onions, yellow squash and egg plant. Phillips Organic will have Heirloom tomatoes, butternut squash, spaghetti squash, patty pan squash and Hill-n-Hollow Vinegars. Mc-B’s will have ground lamb, stew/kabob lamb, chicken by the cut or whole, rabbit and more! Mackenzie’s, J&W, Nice Fruit Farm, GAM’s Bakery Mellander Maple and Peg’s Produce will all be there too! Entertaining us this week will be Denise Duthe on Harp and in the community booth will be the good folks from First Presbyterian. Looks like it will be a beautiful day to shop. Hope to see you in the morning! Opie’s Gift Gallery will have reversible aprons, scarves, ties and much more. 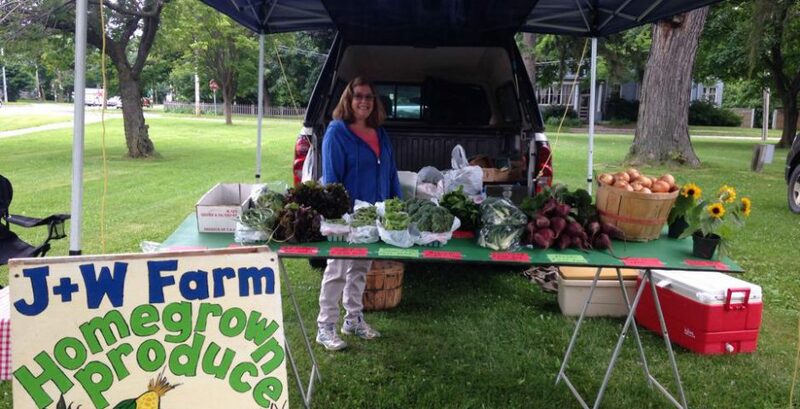 Phillips Organic will have Swiss Chard, Butternut and spaghetti squash, heirloom tomatoes, Hill n’ Hallow blueberry vinegar, and dill. GAMS Bakery will be there with cinnamon rolls, sweet rolls, cookies, muffin tops, hand pies, hot coffee, tea and cocoa. J&W Farms, Mackenzie Farms, Nice Fruit Farm, Dave the Honey Guy, and Mellander Maple will all be there too! Entertainment for the day is Bev Hess on Vocals and Rotary Club of LeRoy will be in our Community Booth selling its November 5th, Appliance Raffle tickets just $10 ea. Looks like it is going to be a beautiful day. Enjoy! Peg’s Produce will be there with Gladiola, cut flower bouquets, sunflowers, Swiss chard, peppers, tomatoes (including compari-type). lettuce, onions, garlic. Crystal from Ma Fille Bakery will be there with apple pie, pear pie, pumpkin pie, oatmeal maple scones, cranberry orange scones, banana bread, chocolate zucchini cake, apple crisp, pound cake, honey oatmeal bread, and donut holes. Dave’s Natural Raw Honey will be there with his full line up of honey products and a very limited run of Strawberry Blossom Honey for sale. Opie’s Gift Gallery will be there with some new aprons and new shawls. Plus they will have some new boy size neckties. GAM’s Bakery will be there with Muffin Tops, Cookies, Cinnamon Rolls, Hand Pies, Fudge dipped Cookies, Hot Coffee, Tea and Cocoa. Mackenzies, Mellanders, Nice Farms, Phillips Organic, J&W and Glen Haven Farm will all be there. With the holiday weekend the musical entertainment and community booth are taking a break but will be back next week. Please come and enjoy your local farmers and stock up for your Labor Day festivities. Don’t forget many of our farmers take bulk orders so if you are looking to can or preserve things like tomatoes, corn, peaches, pears and more don’t be afraid to ask them for their bushel rates!